Perhaps the film’s finest discovery might be Derek Lyons, a fresh-faced zen Buddhist and schoolteacher with his own brand of martial arts, who was a background extra in the closing scenes of “Star Wars,” but who has nevertheless struggled, by his own admission, to escape the shadow the film’s cast over his life. He’s a compelling and sympathetic tragicomic figure, one undoubtedly reminiscent of a character in “Extras,” and Spiras’ study of him is a highlight of the film. Welcome to Lightsabre. Our latest guest has a list of projects on his CV that would make any actor proud. Star Wars, Superman, The Shining, Gandhi, Who Framed Roger Rabbit and Indiana Jones and the Last Crusade, as well as recent projects including the highly successful Secret Diary of a Call Girl. Please give a warm welcome to Derek Lyons. Q - Derek, welcome to Lightsabre. A - Thanks Mark, it my pleasure and thank you so much for asking , I am honoured! Q – Star Wars fans know you from your role in the original film as a Massassi Temple guard, but you were already flying in high circles before that working for Record Mirror as a reviewer, where you met many of the great artists of the mid to late 70's. That must have been a fascinating life to lead. A – Yes I really enjoyed my time at Record Mirror, my first ever job was working within the music industry for Record Mirror, Sounds and Music Week. There I met many great music writers such as the DJ John Peel (a lovely man) and many bands who came for interviews and parties. I wrote reviews of concerts and took photos of bands like The Jam, The Clash, The Stranglers and The Stukas. I became good friends with Paul Weller, Hugh Cornwell, Shane MacGowan, I took the very first photos of Shane (The Nips/The Pogues) and Eddie and the Hot Rods. My pictures were published in Timeout, NME and Melody Maker. I was offered to work for CBS records and also EMI but turned them down. I use to visit Track Records, The Who office many times and had many good friends there including Mike Shaw (Manager) and Paul Cummings later to become Co-Manager of Dire Straits! I also met Thunderclap Newman at the office and one day sang 'Something In The Air' with him whilst he accompanied me on piano! Peter Jones the Chief Editor of Billboard said of me one day "Derek, your enthusiasm for the music business has always been fantastic and you have great knowledge of the industry. "You have a pleasant personality and you should go far in what ever you do". This was the man who discovered The Rolling Stones! In 1976/77 I almost met Kate Bush, went to EMI RECORDS in Manchester Square in London . I was to go to the PR dept to pick some copy up for Sounds and Record Mirror, where I worked at the time. Had a coffee Andy Childs I think it was, he told me that they had just signed a very talented girl called Kate Bush and that she was in the other room. Andy asked me if I would like to meet her, I was shy then and said "No thanks, maybe next time"! What a silly teen I was! I also picked up the a Kings Costume worn by Marc Bolan for the Record Mirror Cover ! Never met Marc but would have loved too! Q – Your screen break came with your role in Star Wars. How did you snag the role? A - Ever since I was a small boy, I would entertain family and friends with impersonations of my favourite actors and comedians, such as Groucho Marx, Burt Lancaster and Jerry Lewis. At Christmas and family occasions I would be asked to sing for friends and family. I always dreamed of being on the stage in a musical or an actor on the big/silver screen. I was invited to audition for the National Youth Theatre, but was so nervous I didn't go (silly me). However, later in my teens I attended a local theatre school. I trained at the Trinity College of Music, London with Jean Marshall, I am a tenor and have a two octave range. It was my dear friend Marvin Gaye who complimented me on my voice and offered that I record with him in the near future, he said I had a ballad voice and really liked it. Sir Nigel Hawthorne was a friend and neighbour of mine, he was kind enough to sponsor me when I joined British Actors Equity, he was a great source and knowledge. And from there I got a phone call from my agent, asking if I was available to work on a film being made at Shepperton Studios called The Star Wars. I was to play one of the rebel soldiers. When I arrived for my fitting, I met the Assistant Director and he thought I would be perfect as the Medal Bearer and the Massassi Temple Guard. This was my first job in the film business - what a fantastic start! My great-uncle Bert Mac was a famous Irish yodeller and recording artist in the 1930s My Other Grandfather Arthur Lyons worked as a tailor for Kilgour French and Stanbury in Saville Row up to 1965 and was responsible for making the suit that Gary Grant wears in' North by North West' Directed by Alfred Hitchcock! So I think this all has been written in the Stars!! Q - Tell us something of your wider career. It seems to have been a varied and wide ranging career so far. A - That is very true indeed! I have assisted on movies and was sponsored be Andy Armstrong (Harrison Fords Stunt man Vic Armstrong's Brother) and Michael Stevenson (Oscar Winner) to become an Assistant Director. Trained briefly as a Stunt Man but time and money was against me. With my Martial Arts (WU-SHU KWAN, AIKIDO), Boxing, Fencing background and as a Fully Qualified Coach and Swimming Teacher, this would have helped. I really could have done anything within the Music and Film business! Q – What has it been like to be a part of the Star Wars phenomenon? 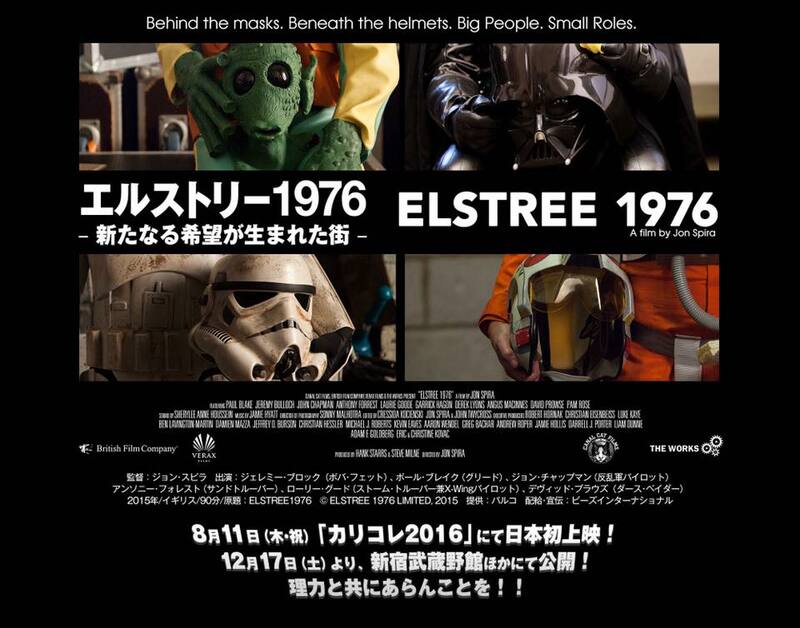 A - As Star Wars was the first film I ever worked on, I was extremely excited about it. I didn't have any other film experiences to compare it with, so I hoped that it would be a big success, but never dreamed it would be the success it has become. There was talk among the other artistes about toys being made of the characters. I really enjoyed meeting the Star Wars fans. Every single one of them was polite and very, very interested in what I did on the movie and asked me questions about Mark and the other stars. I was taken aback by their enthusiasm and excitement in meeting me. People travelled from as far afield as Japan and also from Europe to meet us at Empire Day 16. I signed Star Wars trading cards, Star Wars tins, t-shirts, books, posters, and the Star Wars trilogy DVD. I was amazed when one young lady asked me to sign her bra, which she was wearing at the time!! I am very grateful and happy with my very small link to Star Wars and really enjoy the time with fans and fellow actors whom are involved with the Star Wars Universe! Q – Not only were you in the original Star Wars but you worked for Lucasfilm again in 1989 on Last Crusade. That must have been a joy, working for LFL again. Were there many familiar faces from the 1976 crew still working for LFL a dozen years later? A - We had a few surprise celebrity visitors turning up on set and yes of course recognised the main actors I got to meet Steven Spielberg and John Rhys Davis - whom I worked with on 'Victor/Victoria' and 'Ivanhoe', he is such a lovely man. I had the great pleasure to chat with Sean Connery about his son Jason, who is an old friend and was a fellow actor on 'Lords of Discipline'. It felt like a reunion. Watching this movie brings back some wonderful memories! Maybe another time! During the filming of the chalice scene, a surprise was arranged for Harrison Ford as it was his birthday. A very large cake was brought onto the set and we sang Happy Birthday to Harrison. We even sang Happy Birthday and shared some cake with him. He was taken aback, but loved it! He looked very surprised and embarrassed, but enjoyed sharing the cake with us all! Michael Jackson visited with his friends and bodyguards to see Steven Spielberg. There were only a handful of actors and crew on set, including Sean Connery. Michael came up to us all, shook hands and introduced himself. Paul Hogan (Crocodile Dundee) was another visitor I remember - he was very funny and I enjoyed talking to him. I sometimes collect autographs and thought it would be a good idea to bring a book on George Lucas' films to the set and get it signed. I managed to get George Lucas, Steven Spielberg, Harrison Ford, Sean Connery, Denholm Elliot and John Rhys-Davies to sign this book. It is a treasured possession. I talked quite a bit to George Lucas about working on the first Star Wars movie, and how much I enjoyed the experience. He remembered me from it and was very nice to me.I'm hoping they will bring out an even more special edition with some out-takes, there were some very funny moments which I was involved with - but unfortunately I can't tell you what they are! Q – You clearly enjoy the interaction with the many fans you meet at conventions around the world. What's the most interesting aspect for you, when meeting fans? Is it the convention talks, the autograph signing or the whole package? A - I had been approached by promoters asking me to attend their signings and have also been getting quite a lot of fan mail through British Actors Equity, I decided that the time was right to start appearing at conventions, my first being Empire Day 16 in early 2006. This was organised for me by Aurelien Lukowski of The Luko Agency, together with Mark Dermul, President of Star Force Events and Publisher of the Autograph Bounty Hunter, Mark also made up most of the pictures that I use at my conventions and has done a wonderful job too. I really enjoyed meeting the Star Wars fans, every single one of them was polite and very interested in my role and experiences on the movie. I was taken aback by their enthusiasm and excitement in meeting me. I recently travelled to Paris for a convention, I was invited by Aurelien Lukowski. He has been very helpful in my convention career. The French fans were just as enthusiastic as the English and very keen to meet me. They had a great knowledge of the movies, the world of Star Wars and the role of Massassi Guard. I have also just appeared at the Darksidecon on 24th to 26th November with my friends Barrie Holland, Joe Robinson and Stephen Fitzalan. This is a Star Wars and fantasy convention which was in Bottrop, Germany. This convention was great fun for me as I got to sing on stage with a famous German celebrity, Klingolaus, as well as the usual question and answer sessions. The promoter told me that I had been a hit and had won the hearts of many German fans! I love meeting the fans and am only there for that reason , OK I have to make money, but that's not my God! Having been to Japan, Germany, France, Belgium and Holland, I must say that all of the Fans are amazing and I love the adventure! 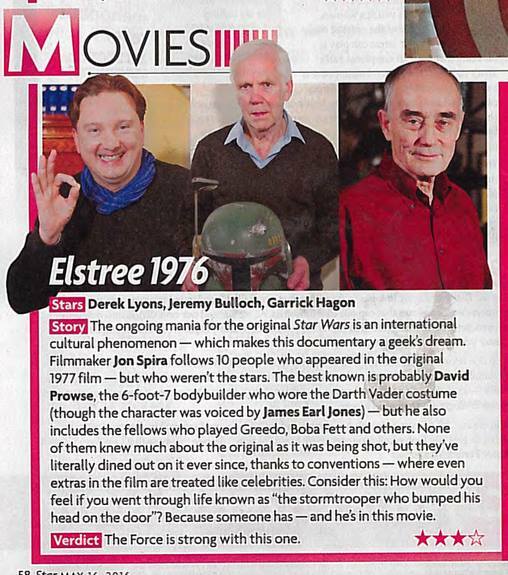 As you may have heard I last appeared at JEDICON 2008 and did two Q and A 's (One of the Actors Eric Walker did not turn up!) 2 hours on stage on each performance in which I talked about Star Wars, Indiana Jones and Bond, sang a few songs, told a joke and finished of doing my party piece THE SPLITS !!! I had nothing planned at all and I was told that I was a hit ! This is a copy of the email Robert Eiba sent me! 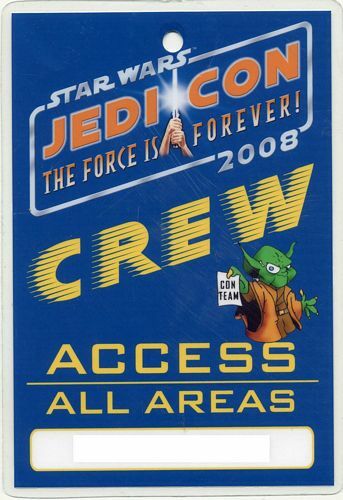 In the name of our team let me say again THANK YOU for joining us at JEDI-CON 2008. It's great that you've had a good time in Germany and you've enjoyed your stay. You were really great on stage and the people loved you! In the moment we don't think about Indy or Bond conventions. Thanks for your nice offer to support us. I will definitely forward Sandra your friendly words regarding her job during the event. Q – You are very proficient at martial arts, Wu-Shu Kwan, boxing and fencing. Did a career in sport ever hold any attraction for you, or is it more of a hobby? A - And a keen martial artist for over 30 years, starting with Wu-Shu Kwan and various other martial arts, including Tai Chi and Aikido. However, a big influence was Bruce Lee and I was fortunate enough to meet and talk with Linda Lee in 1976 when she was in London promoting her book about Bruce and their life together - ‘The Life and Tragic Death of Bruce Lee’. I am accomplished boxer and fencer, and a fully qualified swimming teacher and coach. So apart from Teaching Swimming which I had taught for 6 Years with huge success the rest was just a hobby! Q – One of your more recent projects was in Secret Diary of a Call Girl with Rose Tyler herself Billie Piper. The show has been a huge hit in the States, garnering brilliant reviews. How did that role come about? A - I was asked for by the director Susan Tully who had remembered me from EastEnders when she was an Actress. I had a scene with her and Letitia Dean way back at the beginning of the show in 1986! I was going through my divorce at this time and came at the right time. It was nice to meet Billie, she was sweet! Q – There’s talk of a Star Wars TV series. Would you be interested in a role? A - I do know Rick McCallum from outside the film world, but if offered I would say yes. Maybe I could play Jabba the Hutts brother??!!! LOL!! Q – You were close friends with the legendary Marvin Gaye, meeting him in a record shop in London and becoming friends until his untimely death in 1984. How did that begin, what was the spark that ignited that friendship? A - The day I met Marvin my life changed forever. I met him in 1980 whilst working in Carnaby Street in a record shop called ‘Rock Dreams’. Marvin was in London working on his last album for Motown ‘In Our Lifetime’. We sparked it off straight away, it was if we had been friends all this and other lifetimes. I was a close friend for three years and travelled with Marvin to Belgium. It was Marvin who complimented me on my voice and offered that he would record with him, saying “Derek, you have a beautiful ballad voice and some day we will work together". I loved Marvin like a father and I know he loved me too. The day he died was a very sad day for the world of music and for me. On the 2nd April 1984 Marvin's 45th birthday, I sent his agent Marilyn Freeman a telegram which read "DEAR MARVIN, I LOVE YOU AND YOUR SPIRIT WILL ALWAYS BE IN MY HEART" Love Derek. I still think of those times together, running, singing, talking about God and the Universe, laughing and having fun. I will never forget Marvin and maybe some day I will see him again! You will have to wait for my book on Marvin, watch this space!!! Q - What do you foresee for yourself in the future? A - Well I have two writing projects, one on Marvin and the other a possible autobiography, which I have been approached to do by a well known publisher! I hope to get some acting work and maybe produce a small movie. I am having some talks at the moment with a friend of my late fathers who is a film producer and who saved my life once when I was 2 and a half!! Q – A quick question about our site, Lightsabre. Any comments? A - Just keep the Star Wars adventure going, your doing a great and wonderful job! Q - It's been a great interview, and thanks for being our guest on Lightsabre. Just one final question. You find yourself in a circular room with no apparent way of escape with three fantasy characters you have shared screen time with - Indiana Jones, James Bond and Roger Rabbit. The room suddenly starts to fill with water and you realise you have to make a choice. Choose one of the three to get you out of there quickest. Who do you choose? A - Ok, well that 's a difficult question. Now I love Indy, Bond and Jessica Rabbit. It has to be Indiana Jones because he always seems to escape! And James Bond for the girl!!! Thanks once again, I have really enjoyed my time with this interview. See you in another time and Universe and MAY THE FORCE BE EVER WITH YOU ALL!